A recent report published by Infinium Global Research on concrete pumps market provides in depth analysis of segments and sub-segments in global as well as regional concrete pumps market. The study also highlights the impact of drivers, restraints and macro indicators on the global and regional concrete pumps market over the short term as well as long term. The report is a comprehensive presentation of trends, forecast and dollar values of global concrete pumps market. According to report the global concrete pumps market is projected to grow at a CAGR of 6.4% over the forecast period of 2018-2024. A concrete pump is a machine used for transferring liquid concrete by pumping. Concrete pump is particularly important in transforming the construction of large high-rise buildings and structures. It is known as a boom concrete pump because it uses a remote-controlled articulating robotic arm called a boom to place concrete accurately. Boom pumps are used on most of the larger construction projects, as they are capable of pumping at very high volumes of the placing boom. Increasing infrastructural investment is the key driving factor for the growth of concrete pumps market. Additionally, increasing demand for high capacity concrete pumps are fueling the concrete pumps market. However, high cost of concrete pumps is likely to hamper the adoption of small industries with less capital investment. In addition, increase in concern regarding economic recession are anticipated to delay the infrastructure activities owing to the political instability and insufficient funds. Furthermore, the growing trend of high-rise buildings, complex design, and mega structure construction have resulted in increased output and improved productive concrete pumps. This in turn have opened several doors of opportunity for the growth of the concrete pumps market over the upcoming years. Moreover, developing economies create significant growth opportunities as the saturation of advanced technological equipment’s are less in some parts of the country. Among the geographies, Asia Pacific is expected to emerge as the prominent market for the concrete pumps market. Additionally rapid growth in the residential construction and the development of infrastructural facilities in the developing countries such as India and Malaysia are showing a considerable growth in the demand for concrete pumps market. Moreover, Europe and North America are anticipated to drive the global concrete pumps market owing to the high environment consciousness during the near future. On the other hand, rising infrastructure in Middle East and Launch of concrete pumps with advanced technologies in Asia Pacific is estimated to help increase productivity in placement of concrete. The report on global concrete pumps market covers segments such as, product type and end-user. On the basis of product type the global concrete pumps market is categorized into truck mounted concrete pumps, stationery concrete pumps and specialized concrete pumps. On the basis of end-user the global concrete pumps market is categorized into industrial, commercial and domestic. The report provides profiles of the companies in the global concrete pumps market such as, KCP Heavy Industries, Apollo Infratech Pvt. Ltd, Fangyuan Group Inc, Concord Concrete Pumps, Alliance Concrete Pumps, Inc., Sany Group, Zoomlion Heavy Machinery Co, Ltd, LIEBHERR Group, SCHWING GmbH and PUTZMEISTER. The report provides deep insights on demand forecasts, market trends and micro and macro indicators. In addition, this report provides insights on the factors that are driving and restraining the global concrete pumps market. Moreover, IGR-Growth Matrix analysis given in the report brings an insight on the investment areas that existing or new market players can consider. The report provides insights into the market using analytical tools such as Porter's five forces analysis and DRO analysis of concrete pumps market. Moreover, the study highlights current market trends and provides forecast from 2018-2024. 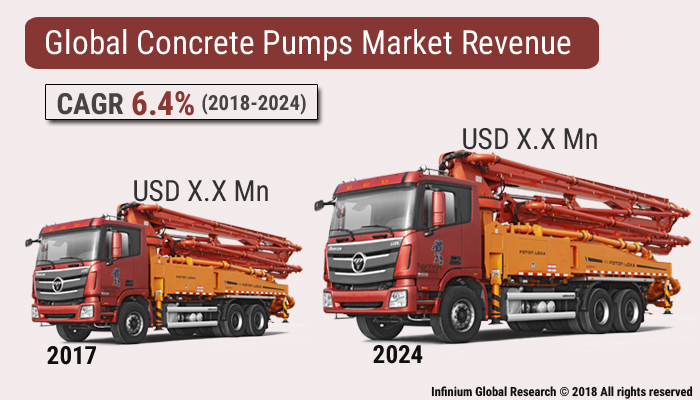 We also have highlighted future trends in the concrete pumps market that will impact the demand during the forecast period. Moreover, the competitive analysis given in each regional market brings an insight on the market share of the leading players. This report will help manufacturers, suppliers and distributors of the concrete pumps market to understand the present and future trends in this market and formulate their strategies accordingly.